Susanna Janssen is a foreign language educator who lives and teaches in Northern California. Thanks to Wordstruck!, we all can now enjoy the words of humor and learning that have benefited the readers of her column, A Word in Edgewise, published by the Ukiah Daily Journal in Ukiah, California. On the surface, one might think that Wordstruck! would mainly be of interest to students of etymology, and it certainly is, but read this book and you will learn to love language as much as Janssen does. So much more than a study of word origins, Janssen teaches language to all of us in a fulfilling and humorous way. In “You Say Goodbye and I say Hello”, we learn why we say hello when we answer the phone and goodbye with our leave taking. We learn that Alexander Graham Bell suggested we always answer the phone with “Ahoy” and that Thomas Alva Edison suggested we always answer the phone with the salutation “Hello” spoken cheerfully and firmly. We know “Hello” won out but “Ahoy” is used to answer the phone in parts of Eastern Europe, where it is spelled “Ahoj”. Goodbye is shortened from “God be with ye” of the 15th century to Godbwye of the 16th century and thus to the modern goodbye. This is just a sample of the information readers will find in Wordstruck! The seven chapters are divided into subtitles with enticing titles such as “Pants on Fire”, “On the Trail of Word Origins”, “The Scholar’s Ink and the Martyrs' Blood” and more. Seven additional chapters round out the book. In “The Herd Mentality”, we read about the names for groups of animals and how they came to be. There is even a name for it – “Terms of Venery” Who knew? “We don’t have a Word for it”, Parts I and II were very enlightening to me. After all, we have all had our moments of “Schadenfreude” (German). I loved "Rum and Revolution", in which we take a tour of Cuba, and as a baby boomer myself I was happy to see we can fight Alzheimer’s by learning another language. Janssen reminds us that, “You don’t stop learning because you get old, you get old because you stop learning”, and as Emerson said: “Do the thing and you shall have the power”. 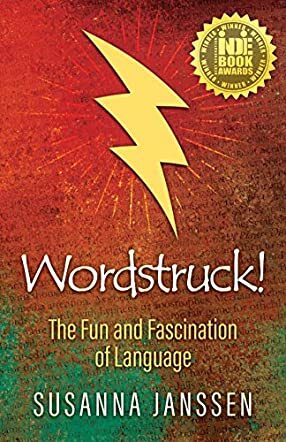 If you love words then you will love Wordstruck! If you don’t think this is for you, read this book anyway. Susanna Janssen’s humorous and easy-to-read style will convert you into a bibliophile before you know it.